Here's an article that Sherry Jones from the rgMOOC shared over the weekend. It's from Scientific American and is entitled What StarCraft Can Teach Gamers About Fighting Cancer. So the question or the discussion here is - what games that are already out that can be used to teach concepts? And how? Feel free to watch this Hangout recorded in December this is kids with their parents giving a virtual tour of the games they play to a group of educators. Kae, I like Guess My Race and Darfur is Dyingfor my Cultural Anthropology class. Right now it is an iPad/iPod/iPhone App, I expect it will end up being available for Android. 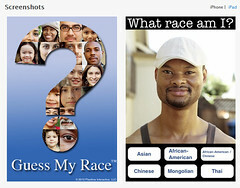 "Guess My Race is a quiz game that was designed to get people thinking in new ways, allowing them to think more critically about the extremely complex issues of race, diversity, ethnicity, religion, nationality, class, and culture." You choose one of the "races" and after the choice, the next photo shows the person and they are explaining how they self-identify their race. Darfur is Dying is an interactive online game that is created to help explain the problems faced by those in Darfur refugee camps for tasks as simple as getting water. We coupled this with a documentary film and played it before and after the film, there was a better success rate at getting water after the film where it explained why they send the children for the water. I would expect that Minecraft would be interesting to use if you had enough time and you had a dedicated server, you could get your class to try to mine enough stone to re-create the pyramids in Egypt or Mexico and the surrounding temple complexes. Would take too much time for my classes. I want to use Spore in my 8th grade Life Science classes. By starting their own life form and watching it evolve including seeing how adding adaptations helps it survive can help students understand evolution and adaptation. "I want to use Spore in my 8th grade Life Science classes." I was thinking of Spore in regard to this question, but since I don't teach any of these areas I wasn't sure if it was actually useful. "I would expect that Minecraft would be interesting to use if you had enough time and you had a dedicated server, you could get your class to try to mine enough stone to re-create the pyramids in Egypt or Mexico and the surrounding temple complexes." This would be interesting as well. I don't really have any great ideas here. I mostly teach game design/programming classes, so when I use off-the-shelf games they're usually for critique/analysis. Most anything can be useful here, so I usually let the students direct what games we talk about. Using an off-the-shelf game to teach game design is a little counter-productive. That said, there are some interesting projects out there. Understanding Games is a series of "games" that teach about games. (The name is a play off Scott McCloud's Understanding Comics). I don't feel like they work all that well, although it is an interesting idea. Code Hero seems like an interesting idea, although they seem to be having a rough time keeping it alive. Hi Al, I can see how it would work for the Life Science class, I did look at it for Cultural Anthropology because you can use evolution, but it just really didn't work well, maybe I will give it a second look. seems like an interesting idea, although they seem to be having a rough time keeping it alive. Ah looks like Code Hero has reached its funding goal with 70K+ over so it will be around for a while. That is the problem with some games, they just don't stay around long enough for us to (a) actually be aware of them, (b) figure out how to use them, and, (c) last through the semester we have them scheduled. At the Denver Comic Con where I was privileged to be one of 100 educations chosen to participate in using comics in the classroom (it is a fundraiser for children's literacy), there was a presentation by two University of Colorado professors Why Teach Comics that was most enlightening. I am going to use comics in my Introduction to Chicano Studies class this fall and maybe my Cultural Anthropology classes. Because of the collateral material available for many of the major comics, Batman is a good example, there are games, films, research, apps, and so many different ways to interact with students. Some forget that Marvel Comics are written at a college reading level. You can see the full schedule here Schedule - Denver Comic Con There were specific sessions on gaming and also playing games. Understanding Games Thank you for the link it will be so helpful for our members, while "games" sounds easy, we all play games, understanding of how they really work is so well-presented in this link. Denver Comic Con does seem to have some great events. I keep meaning to go one of these years, but it's never quite worked out. The Poptropica game got my attention because he said there was a connection with history. I looked at the site and I didn’t see a lot of history except in the Time Tangled Island. There seem to be several islands that connect with literature: Charlie and the Chocolate Factory, Red Dragon Island (Magic Tree House), Wimpy Wonderland (Diary of a Wimpy Kid), Mythology Island, etc. There certainly are a wealth of different Islands that could be used in connection with different topics, journal writing, book genres, etc. I think I’ll make an account and see what it is really like. I think I would probably want to work with teachers to set up specific quests to direct kids in engaging in and responding to the relevant content. Some time for free exploration would be good too, since games are mostly fun when they are voluntary. It might also be interesting to set up a gaming club and have the kids explore the game and tell us which parts are relevant to what they are learning in class. Another game that I like is Lure of the Labyrinth. It combines narrative, comics, and algebraic thinking and puzzles in a creative and challenging way. It is free and teachers can set up classes to monitor students’ progress. Students create a character and go undercover in a pet food factory that is a front for stealing pets. They have to do a lot of exploration to figure out where they are supposed to go and what they are supposed to do: a lot of trial and error. Even I had to struggle at times to figure out how to get through a particular challenge. I think it would give students a good opportunity to practice helping each other. 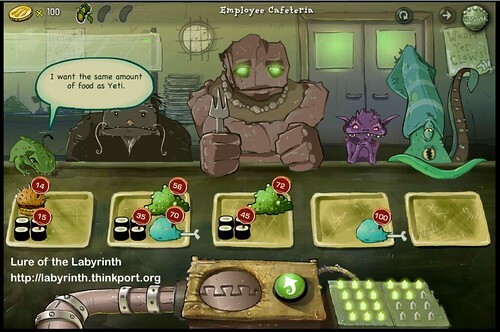 The player is supposed to give each monster the correct amount of food based on ratios between the trays. When I made a mistake, the monster explained why it wasn't right, giving me a clue to help me. Players have to look for and keep in mind multiple relationships - it's a great challenge that can lead to some great fiero when success is found! These just got posted on the "Games for Good" Rockethub. I have not played most of these, but thought I'd share. This week I’m going to be talking about educational games, but I’m going to try to avoid the well-known titles like Carmen Sandiego, Oregon Trail, and Math Blaster. I’m also trying to avoid games that are simply dressed up flash cards/mini-quizzes (though some like Clockwork Brain do it fairly well). One of the best logical and problem solving puzzle games of the heyday of educational games. What I love about this title is that it doesn’t try to teach you a specific subject but rather tries to teach you how to think. It teaches you the fundamental logical reasoning techniques without it being at first apparent that that is what it’s doing and encourages you to learn by trial and error rather than encouraging you to be afraid of failure (as much of our modern schooling does). Perfect for 7-11 year olds, but fun for the whole family. I very rarely call games serene, but that’s how I’d refer to the endless ocean series. There’s no combat, no tense moments, it’s just about exploring the ocean and coming to better understand the oceanic wildlife. If you’re looking for a peaceful journey undersea that will leave you with a little bit more knowledge about our aquatic ecosystems, this is the series for you. It’s a little complex and a little slow for younger audiences, I’d probably say it’s good for people 12+. One of the lesser known offshoots of one of the best known franchises in gaming history, Colonization was a fantastic branch of the Civilization empire. It forced the player to think through many of the fundamental problems of colonization, both practical and moral, while at the same time educating them about the real world personalities that helped shape the colonial efforts in North America. A fantastic remake was released with Civ 4. I highly recommend you get that version. The game is very complex, but remarkably engaging; I think people as young as 9 can get a lot out of the game…though you probably won’t beat the game until you’re 13/14. Not exactly a game, Zon is an MMO that teaches you Mandarin Chinese. It has story events and mini-quest, but it’s not an MMORPG exactly. There’s no fighting monster or hoarding loot, instead it’s about having social interactions with NPCs, doing the kind of tasks you might naturally be faced with if you were in China: buying a meal, asking for direction, &c.
Because of its MMO nature and its pacing I’m just going to call this one 14+. Because I’m talking about games to help you learn a language, I thought I’d put this up here as it is, to say the least, an interesting experiment. Magicians is a pen and paper RPG that is meant to help you learn Korean. You weave spells in the world through using the Korean language and gain your power through telling stories. As this is a fairly complex, storytelling tabletop RPG, I’ll call this 14+ though I think you could go younger if you’re willing to work with your kids a fair amount. I actually played this game for way too long. It’s like Game Dev Story but with way more gameplay and about defending people’s civil rights. It’ll teach you about US Civics, the bill of rights and what you’re entitled to as a US Citizen. And it does it all without feeling like it’s a bunch of flashcards (even though it sort of is). You might argue I’m stretching the definition of educational a bit here, but I really don’t think so. I learned a great deal about how we actually get a manned craft from this planet to space just by playing the game. Additionally it taught me things about physics, aerodynamic, rocketry and engineering. This game is remarkably complex and the tutorial isn’t that friendly, you really have to want to dig in in order to get all the value out of it. I’m going to call this one 14+ as well. This game may never come to light, it may never get published or see wide audience release but I got to play an early build and hope, even if this game dies on the vine, that someone else takes up the idea. This was a game about teaching coding through games, about making the player manipulate their environment through altering the code in order to overcome challenges. It was an engaging way to make programming not scary, to make it something anyone felt like they could pick up and run with. I’m wary of putting an age on this one because I don’t know if it will be even remotely similar when it comes out, but the version I saw I’d say 14+. Sort of a real time strategy game about cell building. It’s an excellent intro into all the parts and functions of a cell, and honestly I think they did a great job making it relatable, but getting into it is a little slow. If you can overcome the hurdle though there’s a lot to learn here about the basics of biology. I’m going to call this one 14+ as it’s really too slow for anyone who isn’t already at least a little interested in cellular biology. This is a fantastic Wallace and Gromit game that teaches basic mechanical principles and engineering. It’s thorough, with an extensive amount of gameplay and innovative puzzles with multiple possible solutions. If you love to tinker with mechanical design you might get a kick out of this one. The game itself is aimed young, so I think an 8 year old would have no problem playing it so long as some could show them the ropes, but it definitely isn’t a “kids only” game, there’s gameplay here for all ages. @blueAppaloosa, I was familiar with that site, the "Games for Good" and had actually used Do I have a Right? in my Introduction to Criminal Justice class. This was at a community college, the students ages ranged from maybe 17 to 45. They though it was a fun game, and a good way to spend 15 minutes before the break (it was a 3 hour class). They felt that the questions were too easy, but they had been studying the criminal justice system for maybe five weeks, perhaps if I had them play it the second week, they might have had some wrong answers. Another one I just found/remembered, The Blu, which is about ocean life. I did look at this one, quite nice, but like so many of these "free games" it requires a download, an install, and still requires you to get an account in order to play it. It does have good graphics, but even a little "stagger" in load on my gaming computer, has nice music with it that fits with the visuals well. For my classes I do like to have the games that run online easily without a sign-up or a download and install. Frankly, in my college classroom (all students do have computer at stations) we can't download and install anything without putting in an order with IT, telling them exactly what we want downloaded and when, and they decide if it will be too much for the computer (WoW is by the way) and the prefer me to tell them a date to remove it. It then depends on the availability of IT to have personnel to do the job. I forgot if I need the signature of my Chair first, been a while. Last one was WarHammer, free version to level 10, and students did need to set up an account. "For my classes I do like to have the games that run online easily without a sign-up or a download and install." I'll admit that students seem to like this type of game the best, but I don't immediately discount something that doesn't meet these requirements. I don't think it's unreasonable to ask students to create an account for a service you intend to use during class (although we've discussed their resistance to this already). I also don't think it's unreasonable to ask them to download and install software on their personal computers for class. Of course, I teach programming-type classes, so I expect this already. Getting IT to install stuff is, unfortunately, a different story. I've run into conflicts here as well. My process isn't quite as complected, but I often end up not getting certain things installed even if the software is free. My classroom has Deep Freeze, so we can install things on classroom computers, but since the computers reboot "clean" we have to re-install them every class (better than not having them, but still a bit of a pain). My philosophy seems to be quite different from IT. I like to put a variety of tools/software on the computer and let the students try different things. IT likes to install as few things as possible. This is particularly frustrating to me since I *was* IT at one time, and managed some labs/classrooms. The instructors would give me a list of what they wanted and I'd install it. The paid software had to get approved and purchased, but if it was F/OSS I'd just install whatever they wanted, no questions asked. I teach programming-type classes, so I expect this already. Getting IT to install stuff is, unfortunately, a different story. I've run into conflicts here as well. My philosophy seems to be quite different from IT. I like to put a variety of tools/software on the computer and let the students try different things. IT likes to install as few things as possible. Amen, to those statements. I haven't even gone the route of trying to purchase specific software, maybe I don't think that far ahead ;) as I would need to get it in the queue months ahead. I did want "Snagit" on the computers to help them with their projects like powerpoint or animoto, but just couldn't get it done. Thank you for all your posts, interacting with you has been a pleasure. 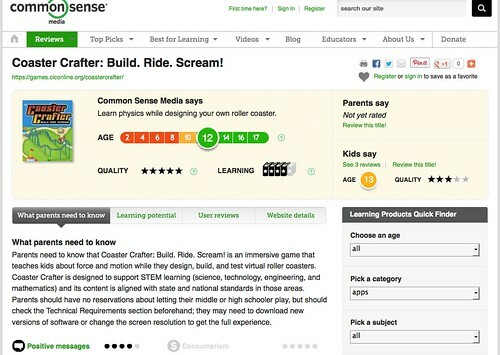 One online game I recommended to fifth grade science teachers last year for their force and motion unit was Coaster Crafter. It doesn’t require any downloads or installations, it’s free, and kids can sign up for an account without an email account. 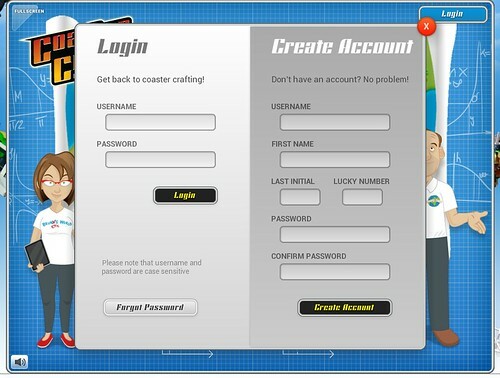 The game has a Design Challenge section that asks kids to fix some poor roller coaster designs. In the process, Brunette introduces relevant science vocabulary: velocity, gravity, acceleration, friction, momentum, etc. 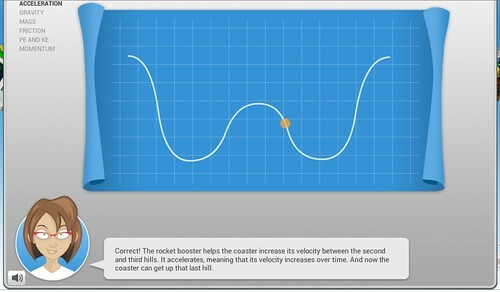 Once Level 1 is completed in the Design Challenge, students can try the Coaster Challenge where they get to design their own coasters that meet certain requirements. Completing the Design Challenges also makes different design elements available in the Free Play section of the amusement park. As a teacher, I might introduce the site by having us complete the Level 1 of the Design Challenge as a class. Then I’d let the kids spend some time working/playing through the site either individually or in pairs. I can imagine some kids getting stuck and a classmate helping them out. Eventually, I might have them do a screencast that shows off their favorite coaster design with a voice recording that explains the design using force and motion vocabulary. By the way, I discovered this game site through Common Sense Media, a web site that offers reviews of books, movies, video games, web sites, etc. for kids, parents, and teachers. It’s a great resource! "School of Dragons can be played online through a limited free account or by paid, full game subscription. For more information and news about School of Dragons: Visit: www.SchoolofDragons.com"